Vancouver, British Columbia: October 16, 2018. Triumph Gold Corp., (TSX-V: TIG) (OTCMKTS: TIGCF) (“Triumph Gold” or the “Company”) is pleased to announce that the 2018 exploration season, on the company’s 100% owned, road accessible, Freegold Mountain property, which began in late March, is now complete. In addition to making numerous long, high-grade and gold-rich drill intersections during the 2018 season (summarized below) two new, at surface, mineral showings were discovered, the Drone Zone showing, and the Maximus II showing. 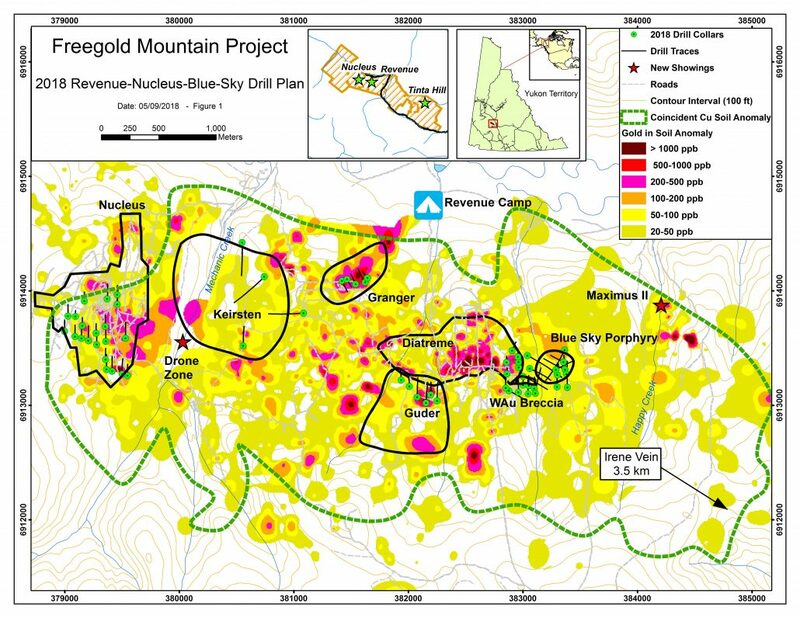 Two new gold (Au) – copper (Cu), (zinc-lead) (Zn-Pb) showings have been discovered on the Freegold Mountain property. Both showings were discovered as a result of local placer mining operations where surficial deposits of gravel were removed exposing previously buried mineralized bedrock (Figure 1). The Drone Zone is exposed over an approximately 100 by 25 metre area in Mechanic Creek, 500 metres east of high-grade drill intercepts in the Nucleus gold deposit, and 500 metres west of drill holes that intersected the Keirsten Zone porphyry system. The zone is open in all directions and has never been drilled or previously explored. The mineralized body covers the entire area of exposure, and consists of granite hosting large xenoliths of biotite schist, and cross-cut by irregular quartz-feldspar-porphyry bodies and thick gouge-rich faults. Mineralization comprises disseminated sulfides and quartz-sulfide veins with pyrite, chalcopyrite, and lesser arsenopyrite and bismuthinite. In one location a sample from locally sourced rock debris contained abundant visible gold. The proportion of chalcopyrite to pyrite increases with proximity to the quartz feldspar porphyry dykes and to the faults. The zone was systematically chip sampled and grab samples were collected from select locations, assays are in progress. The Maximus II Showing was discovered in a newly exposed placer mining cut in Happy Creek, located approximately one kilometre to the northeast of drilling that intersected high-grade gold-rich mineralization at the Blue Sky Porphyry (e.g. news releases PR18-08 dated August 23 & PR 18-09, dated September 12). The Maximus II showing consists of multiple thick (up to one metre estimated true width) domains of dense veining and vein breccias with polymetallic mineralization that are exposed discontinuously over 70 metres strike length and are open in all directions. Thick zones of carbonate-quartz-sulfide altered metamorphic wallrock surround the veins and breccias. Sulfides consist of pyrite and arsenopyrite with lesser sphalerite, galena and chalcopyrite. Where exposed, the Maximums II was systematically channel and chip sampled and grab samples were collected from select locations, assays are in progress. 17,566 metres of diamond drilling, in 74 drill holes, testing six areas: Revenue East, Blue Sky Zone, Nucleus, Granger, Guder, and Irene. 1,100 metres of trenching that tested four areas: Blue Sky Zone, Guder, Granger and Cabin. Soil sampling over a 4.3 square kilometre area (925 samples). An IP-DC-MT geophysical survey over the entire Nucleus-Revenue-Blue-Sky soil anomaly (≈30 line kilometres). A ground magnetic survey over Revenue East and the Blue Sky zone (≈50 line kilometres). Extensive prospecting in the Nucleus-Revenue-Blue-Sky area, leading to the discoveries of the Drone Zone and Maximus II showings (see above). Delineated a zone of high-grade, gold-rich porphyry mineralization in the Blue Sky Zone with six drill holes (e.g. RVD18-19 with 316.00 metres*** of 1.79 grams per tonne (g/t) gold equivalent (AuEq*) including 79.75 metres of 3.34 g/t AuEq*) (news releases PR18-08 dated August 23 & PR 18-09 dated September 12). Intersected gold-rich breccia mineralization in the WAu Breccia with five drill holes, defining high-grade mineralization over a 130 metre strike length and to a depth of 200 metres (e.g. RVD18-08 with 128.00 metres*** of 1.27 g/t AuEq*. and RVD18-28 with 43.02 metres*** of 1.50 g/t AuEq*) (news release PR18- 07 dated July 31). Defined mineralisation on the little-tested eastern side of the Revenue Diatreme (e.g. RVD18-02 with 44 metres*** of 1.08 g/t AuEq*) (news release PR18- 07 dated July 31). Future 2018 news releases will include results from exploration drilling in the Guder (1,352 metres) and Granger (1,014 metres) zones, exploration and resource drilling at Nucleus (4,159 metres), and inaugural drilling of the Irene epithermal vein (1,369 metres). Results of trenching, prospecting, soil sampling, and geophysical programs are also pending.